Hall of Fame inductee Ozzie Smith threw the ceremonial first pitch. 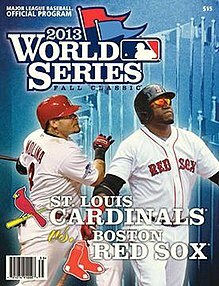 In a rematch of the staff who faced off in Game 1, Jon Lester again outdueled Adam Wainwright to give the Red Sox a 3–2 series lead. 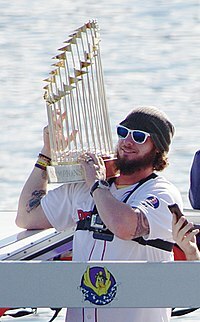 Boston scored first for the first time since Game 1 when Dustin Pedroia and David Ortiz hit back-to-back doubles with one out in the first.Matt Holliday tied the score with a home run to center in the fourth inning, but it would be the only run Lester would allow over strong 7⅔ innings of work. Wainwright matched Lester until the seventh inning, when a ground-rule RBI double by David Ross and RBI single by Jacoby Ellsbury scored Xander Bogaerts and Stephen Drew to give Boston a 3–1 lead.Koji Uehara relieved Lester with two outs in the eighth and retired all four Cardinals he faced to earn his second save of the series. Following the team's World Series win, Boston Red Sox fans congregated at the site of the Boston Marathon bombing to celebrate the title. The white lights of Boston's Prudential Tower displayed "GO SOX." 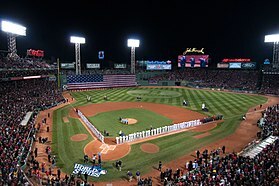 Red Sox owner John Henry said after the game that the parade would take place on Saturday, November 2.